The Philippines has one of the fastest growing rates of HIV infection in the world. The country is one of only nine countries globally where the number of new HIV cases has increased by over 25 per cent. Also, new HIV infections among 15-19 year old Filipinos have risen by 50 per cent over four years from 2010-2014. According to the 2013 Young Adult Fertility and Sexuality Survey (YAFSS) only 17 per cent of young people in the Philippines demonstrated correct knowledge about HIV and AIDS and 70 per cent of young people’ sexual interactions are unprotected. “We welcome Pia as a new champion for children and young people who are at risk of HIV. Her influence can help end the silence against this ‘hidden epidemic’ that is happening in our midst. Young people have the right to health and survival, and that includes giving them information that they need to prevent HIV,” UNICEF Philippines Representative Lotta Sylwander says. In the Philippines, UNICEF is helping in the HIV response for adolescents through gathering of data and strategic information, advocating for laws that are responsive to the needs of children and young people, giving adolescents life skills and leadership trainings and helping the government, NGOs and youth networks improve service delivery to respond to the crisis. Ms. Wurtzbach during her HIV session shared experiences and stories with young people involved in the HIV response, as well as those who have acquired the virus. 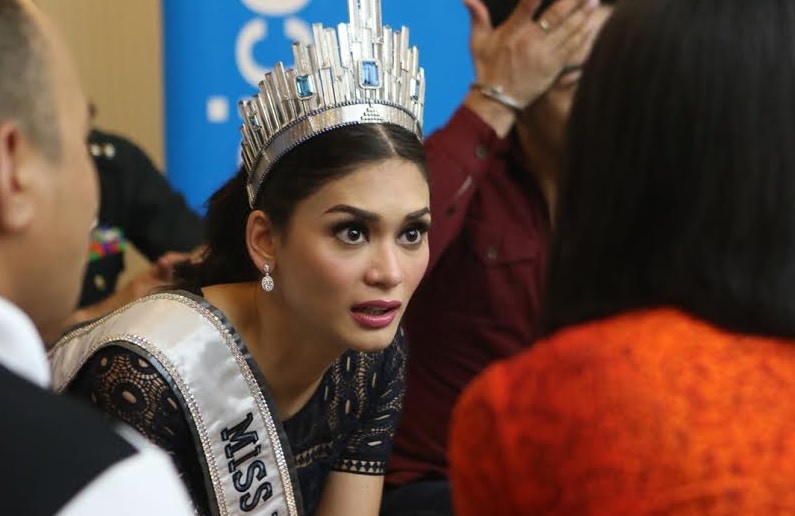 By spending time with them, Ms. Wurtzbach also hopes to end the stigma against people living with HIV and encourage people to talk about HIV openly. “What we can do as a country is to talk about what is happening and what this means for our country and for our children. We should encourage discussion and come together to find solutions. Ordinary Filipinos like you and me have the power to stop the spread of HIV. Change should start from ourselves by knowing what HIV is, how to prevent it and knowing our status by getting tested,” Wurtzbach added. The Binibining Pilipinas Charities Inc. (BPCI) supports the current Miss Universe’s call to increase awareness on the rapid increase of HIV cases. Mrs Stella Marquez Araneta, Bb. Pilipinas Charities Chair believes that Wurtzbach is an excellent communicator and will be an effective agent in relaying information regarding this global issue. “Pia can use her good communication skills to raise the alarm over the issue on HIV. She is a social figure to whom the youth can relate to easily especially in this age of social media. With all the trainings she went through when she joined Binibining Pilipinas, I am confident that she is the perfect voice for this cause,” Marquez Araneta says. Founded by Stella Márquez Araneta, BPCI has been a key partner in nation-building for over four decades. BPCI pursues its mission of spreading peace and love across the nation and is a fund-raising activity for projects that would benefit orphans, indigent families and other less fortunate members of Philippine society.